🌟 This concludes my journey of reading all Mr. Backman’s books this year and it has been a wild ride. I actually kept this for the last because I thought it would be my favorite but unfortunately it wasn’t. 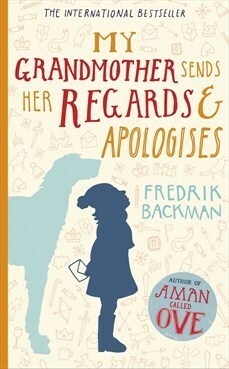 🌟 Backman is a great author when it comes to elderly quirky characters and judging from his more recent works he expanded that to writing books that include the whole community such as (Beartown and Us against you) which were my favorites. I also read his short stories and sadly didn’t enjoy them, I said it before and I repeat it; Backman is a great contemporary author but he should keep into that and not venture into fantasy. 🌟 His writing is just so relatable, so close to my heart and I easily gets into his stories. His stories are realistic and emotional and delivers the whole bunch. That’s why I am saying that I don’t like the fantasy parts, He uses a lot of metaphors and comparisons between the fantasy world (That Elsa and Her Grandma shares) and the real world to send a message but he did it in his other works without this and it was better. 🌟 I like the characters that he portrays, they are always memorable, I liked that Britt Marie was in this book too and we get glimpses into her past. All the characters were lovely in their own way but I had a problem with Elsa who was too precocious, I think she should have been at least 10 years old. I don’t usually care about ages in stories because most characters are precocious but Elsa seemed like a prodigy and wasn’t convincing for me. 🌟 Summary: This is a good book -It is written by Backman after all- which has great writing and unique characters as usual. There was a mix between a fantasy story and a real one, I expected a more emotional read but didn’t get that. This was Backman’s second book after his widely successful “A Man Called Ove” so it must have been hard, I like that he develops a more distinct voice as he writes and this was part of his journey. I ended up giving it 3 out of 5 stars! 🌟 Prescription: For Backman stans who wants to discover his whole writing journey. I liked the character but imagined her older! Thanks and I hope you like it even more than I did. But A Man called Ove and Bear Town are excellent alternatives if you didn’t like this one! Hamad has read 2 books toward his goal of 52 books.